1. What is the turn round time for a logo? This will vary based on which logo design package my clients choose. As a rule I send my clients their initial logo design(s) no later than 7 workings days from the initial payment. Once the initial designs have been emailed the turn around time varies based on how quickly my clients get back to me with any requested changes. The initial designs are what takes the longest time as I put a lot of research, thought and planning into the initial designs. Any changes are done as soon as possible. If I was to give a rough estimate of an average turn around time - I would say 2 weeks from initial payment to final completed logo design and final files sent. 2. How much does your service cost? I have some existing services and packages that have set costs to give you an idea of the cost of design work. However I also supply free no obligation quotes on all design work. If there is not a package or service on my website that suits you then please get in touch with me today to get your quote underway. I make sure I accurately quote on all design jobs, either by a custom quote or through existing service / package prices. Once the quote / price is approved and my client wants to go ahead I email out an invoice for the initial 50% deposit and also the customised design questionnaire. Once this payment and answers to the questions have been received, along with any required images and text, I log the job in to my design list. I get in touch via email to let my client know that payment has been received and I also let them know the estimated timeframe for them to expect their initial proof. From here I work on the initial design, which includes but isn’t limited to research into my clients business, design styles, ideas, colours, layout etc. Once I am happy with the initial design I send my clients an email proof. The next step is that my clients give me feedback on the design and let me know if any changes are required. I then go and make the requested changes and email the revised proof(s). As a standard term 3 rounds of changes are included in my design prices, if more changes are required they are invoiced out on top of the design price (this is discussed with my clients before any more fees are applied). Once the final design is approved I email out the invoice for the remaining 50% of the cost. Once this final payment has been received I email my clients that their files ready to go. 4. What files do I get? That depends on what design service you get and what file types you need. With a logo design you get: png, jpg, eps and pdf file versions of your logo. If you are getting business cards designed I will supply you with the file types that your chosen printer needs (or I can sort the printing for you myself) which is usually PDF files. 5. At what point do I own the designs? 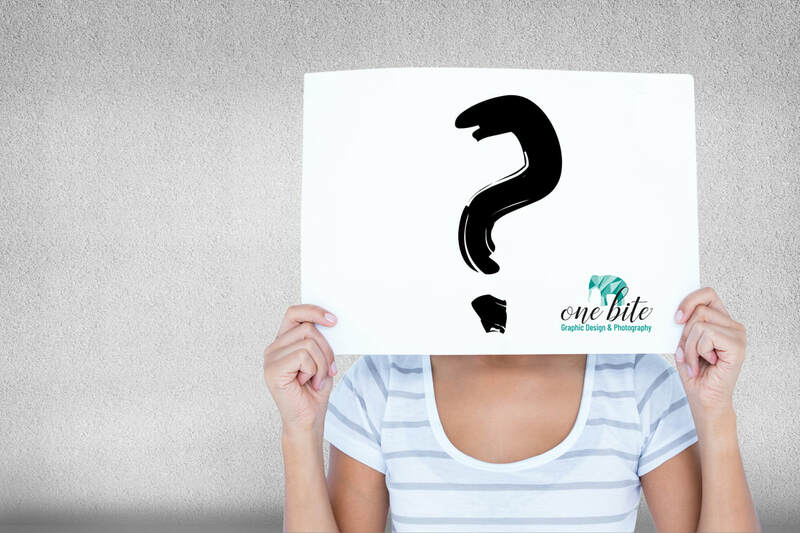 Any design options that are sent to you during the design process are owned by One Bite Graphic Design & Photography and permission is not given for them to be reproduced by anyone else. Once a design is approved and fully paid for, you, the client, will own the the design. 6. Can you arrange printing? Yes I can arrange the printing of your designs in a variety of formats. I like to use other New Zealand based businesses for this where possible. I will source a few quotes from my suppliers and send you a quote from the most cost effective printer for the type of print job you require. 7. What can I expect with product photography work? Clients generally email me with their initial request to use my photography expertise. A detailed questionnaire is sent out prior to any photography work being started and an invoice for the initial 50% deposit. Once payment and products for photographing have been received I log in the photography job in to my work list. Within 7 workings days from initial payment and products being received, initial photography proofs are sent. These are sometimes done in a low resolution unedited form to make sure my client is happy with the layout and style of the photo. From there I take all the required photos and edit them. All product photos are then sent to my clients for final proofing. Once the final photos have been approved and signed off the remaining 50% of the cost is required. When the final payment has been received the full high resolution photos are emailed or placed in to a DropBox folder. 8. How does a branding package work? Clients have generally read my website information about getting a branding package and email me. I respond with the logo design questionnaire and an invoice for the initial 50% deposit of the brand package. Once that is paid and the answers are received I start with the logo design. We go through the process as described above in FAQ #3. Once the logo is approved we move on to the next required design job, which depends on which package my client has chosen. All the design work gets completed through to final approval. From there an invoice is sent out for the remaining 50% cost of the brand package. When the payment has been received the final files are all emailed. No files are sent until the full package has been completed and paid for. 9. What will you need from me to get started? For most design jobs I have a small questionnaire that I send out to establish a clear design track to run on before any design work starts, so for a start I require the answers to those questions. For some design jobs I require text, images and logos to be supplied, this is made clear through communication with my client. 10. How many revisions come as standard? Included in all of my design prices is 3 rounds of changes. This is not 3 simple changes but 3 complete sessions of changes. For example if I am doing a standard logo design which includes 4 initial designs, if changes are required to these designs that is considered 1 change even if there is a list of requested changes.